Wow, thank you all for your wonderful comments on my last post; I am truly overwhelmed! And welcome to all of my new followers; I usually do like to welcome people by name, but as the number of followers to my little blog has basically doubled in the last two weeks, I will just have to extend a heartfelt, "Welcome, all!" And now, on to what I've been working on. Well, one of the things that I've been working on; I am one of those people who has a huge pile of garments in various stages of completion. It's terrible, I know, but I just can't seem to stop myself! 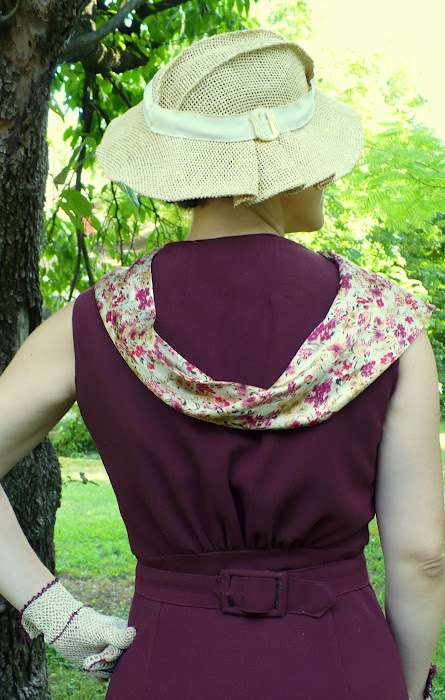 I made this dress with some beautiful burgundy crepe (okay, crepe-like fabric; I have no idea what it is made out of...but it was $1.00 per yard!) accented with a satin floral. I made it specifically to match these beautiful gloves, which I got from ebay. 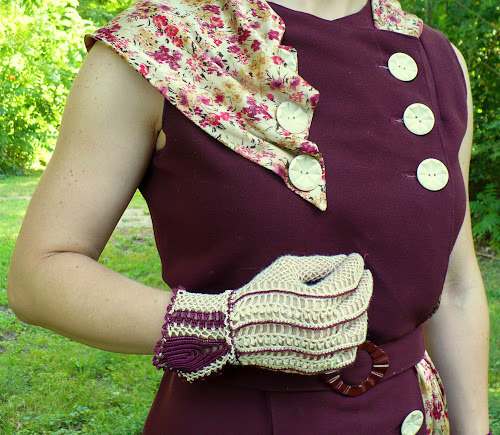 The burgundy trim around the top of one of the gloves was missing, and there were a few other issues with them; of course, even though I have no knowledge of knitting, crocheting, or tatting (I think the trim was tatted, but I'm not too familiar with it), I was SURE that I could fix them. Someday, this over-confidence in my crafting abilities will be my downfall, but I've been lucky so far! I basically just tied a series of tiny knots with embroidery thread, trying to make it look as similar as possible to the existing trim on the other glove. I made the dress using this pattern, with a few alterations, of course! I made it with detachable long sleeves, because anytime I have an opportunity to make something wearable year-round, I'm all over it! Since it has been 100+ degrees here lately, you'll just have to wait until it cools off a little bit to see the sleeves! I also wanted to incorporate the scarf into the dress a bit more. 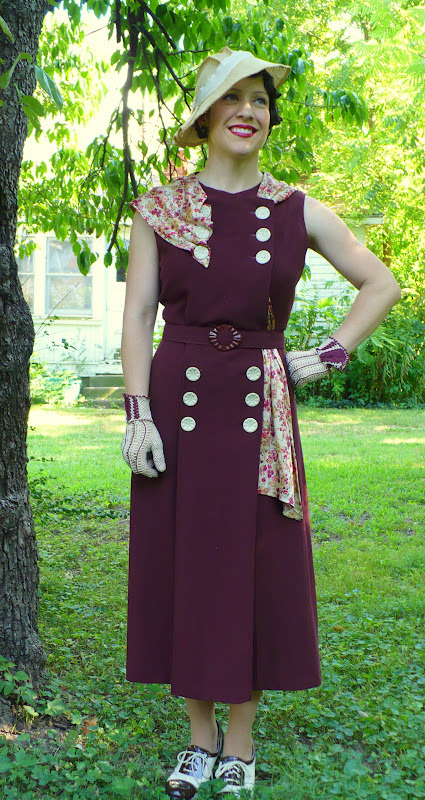 Since this is one of those dresses in which one side of buttons is simply sewn on (no buttonholes), I sewed the scarf under the buttons, draped it around the back, and brought it back through the dress, letting it hang at the side. Here's the back. I let the scarf drape down and then tacked it in place on the shoulders. 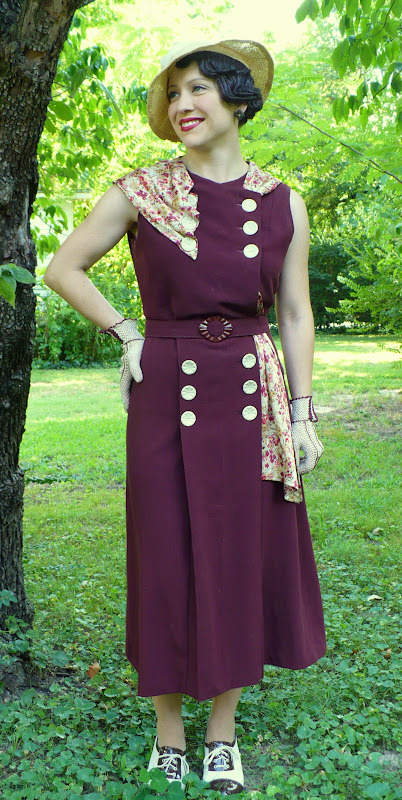 I don't have a huge collection of vintage buttons, so the ones that I used on this dress were chosen solely for the fact that I had twelve of them. They started out a lovely shade of yellow-green, and I spray-painted them cream to match the scarf. Since they are metal, I hoped that it would work; I cleaned them, painted them, and sealed them. So far, so good...no chips! These are the same shoes from my last post, but in brown; I love them so much that I am basically just alternating between the two pairs! And, of course, my new favorite hat. I really like the way that it turned out, especially the way the scarf mimics a cap sleeve on one side. What do you think? P.S. If you liked that altered sweater from my last post, you will love what is coming up next!! I love this! The color combination is gorgeous and that's such a creative use for a scarf! I have a lot of beautiful vintage scarves but the pattern tends to be lost when worn. As for tatting/crochet and what not, you can do it!! My husband (oddly enough) loves to tatt. I've never tried it myself but he says it's very relaxing. Crochet is pretty easy too, once you get the hang of it. Love your hat!! This is beautiful. Where do you like to shop for your patterns? Oh my gosh. That dress is STUNNING. The colours and the design - simply fabulous :) You're amazing Lady! Love it... again! 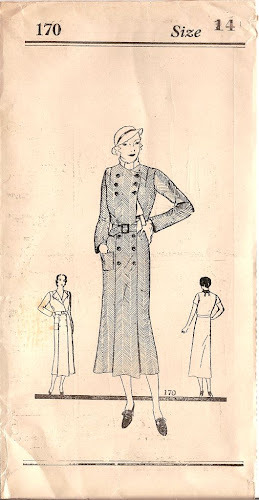 :-) Actually you gave me an idea for button placement on my Eva Dress 1930s blouse. And a big yay for the skirt length! what I think? Please, adopt me! so hopefully some of your creativity, talent and skills might rub off on me. the gloves are a dream! and I love everuthing you did with the dress. you've certainly improved the pattern. ABSOLUTELY STUNNING! I really love this outfit! Such a clever use of the scarf...check out my blog later today as I have a pattern giveaway I think you would love! This is perfect! You are a great inspiration and a delight to see! I just love how you worked the scarf into the dress, it looks so great and classy! And the colors are perfection, work all year round! The scarf detail is so perfect! (Actually, the entire outfit is perfect! 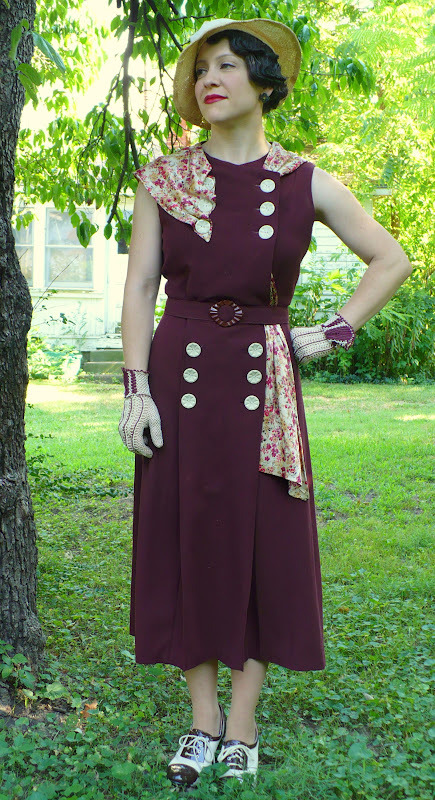 :) I am always inspired by how details such as that were really utilized in 30s fashions. The alterations you've made are fabulous. And detachable sleeves? What a great idea! I love the scarf detail, you are such an insperation. Gasp! My chin just hit the floor... What an incredible inspiration you are! Amazing work!!! What a gorgeous dress. And I'm stunned by how much you look as though you've just stepped from the pages of a 1930s catalog! Um, wow, is all I can say. You look stunning. Simply GORGEOUS! This is one the most stunning renditions of vintage I've seen. I love it. You look picture perfect and I love the length on you. Too gorgeous for words! Your creativity and talent amazes me. To envision this final garment from the original pattern takes such an eye for detail and beauty. Your pictures look like they came right out of the 1930s, everything is perfect. 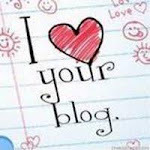 I am SO pleased to have found your blog via Sew Retro. I discovered you earlier in the year before I knew about the workings of RSS feeds, and then I couldn't find you again when I wanted to subscribe! So hurrah - here you are. Wow! You look amazing. That dress is incredible. I love the changes you made. Sooo unique. Seriously. Your style is pure inspiration. Beauuuutiful! I would absolutely die of heat exhaustion in this type of fabric right now...kudos to you for looking so cool in it!! Hello from California! My name is Karen Lavoie, and I'm very impressed with your creativity, as well as your dedication to the 1930's. I'm writing to ask if you have ever heard of Costume College, sponsored by the Costumer's Guild West? It is a weekend costuming conference held annually by our organization, emphasizing costuming skills for all levels, historical facts and such, and features more than 100 classes one can take during the weekend--all taught by volunteers. Each year a huge variety of class subjects are taught, in addition to there being a Bonus Track of one particular time period of interest. Some are lecture, and in others actual garments, trims, etc are actually constructed. Our next one is in a week and a half; although it may be too late in the game for you to mobilize, I would invite you to check us out on the internet at www.costumecollege.org. You can also link from there to the Costumer's Guild West website. And the cost is exceedingly reasonable--I've been a member sonce 2002. I'm not trying to be overly nosy, but I'd like to inquire: Where in AR are you? I ask because my husband and I have costuming ties to Arkansas--his great grandfather was a Civil War hero from Fayetteville, and we are supporters of the Washington County Historical Society. 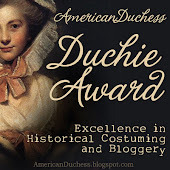 In fact, I have been invited back to Arkansas next March or April for the Arkansas Living History Assn's annual meeting by --in addition to doing something with bonnets, I am going to make a small presentation on Costume College to inform people about this wonderful resource to their period interpretations. For the past 7 years I've been working with the WCHS Director of Historical Programs' DeeDee Lamb, and just met Mrs. Pody Gay from the Shiloh Museum. I would enjoy meeting you when I'm next in Arkansas. Now, as this would pertain to an aficionado who makes it her style to interpret the '30's daily, I can tell you there is some talk that next year's Bonus Track will be about the heyday of the 30's--I am not sure, but must wait until the Dean of next year's College makes her official announcement on July 31st. This is another reason I have posted to you, in addition to telling you your work is lovely: it's right up your alley and if I may be so bold, you belong with us! If you would like more information, my personal e-mail is snuzequeenataoldotcom--spelling it out so as not to be prevented from posting. Hi, I followed a link over here from another costumer. I'm an historical costumer, and am all over the eras. I haven't made anything past 1918 yet, but am dabbling in the 30's. I'm also an attendee (since 2003) and teacher at Costume College as Karen had mentioned. And she's partly right about next year's theme. I think it would be right up your alley. I love the colors and trims you use. They're amazing. HI There! i just came across your blog thanks to the Butterfly Balcony, and I have to say I am in LOVE!! You are one crazy talented lady and am so jealous at your sewing skills. I absolutely adore the dress, and think the contrast sits perfectly with it! Hopefully with a little more practice I might be able to create something soon again too! thanks again and cannot wait to see your next creations! Thank you all so much for your comments! It is so nice to have positive feedback from like-minded people! Karen and Val: Thank you both for the information on Costume College; I've visited the website, and I must say, it does look wonderful! If only I weren't so far away! Karen, I live in downtown Springdale, about a block away from the Shiloh Museum! I'm embarrassed to admit that I haven't been involved in very much since giving birth to my first child two years ago, but I am hoping to change that very soon. Please do contact me when you plan to be here in Arkansas; I would love to meet up!